The final step is just for finalizing your form: pushing it into "live" mode. This tells Form Tools to start storing the submissions. What you need to do depends on the submission type: direct or code via the API. Both are quite simple. Now refresh your form page. Going forward, submissions should now be stored in Form Tools. Change the ft_api_init_form_page line on the first page of your form to whatever line is displayed in the Add Form Step 6 page. It will looks something like this, except the X will be your form number. Then visit your "thank you" page to empty the sessions. 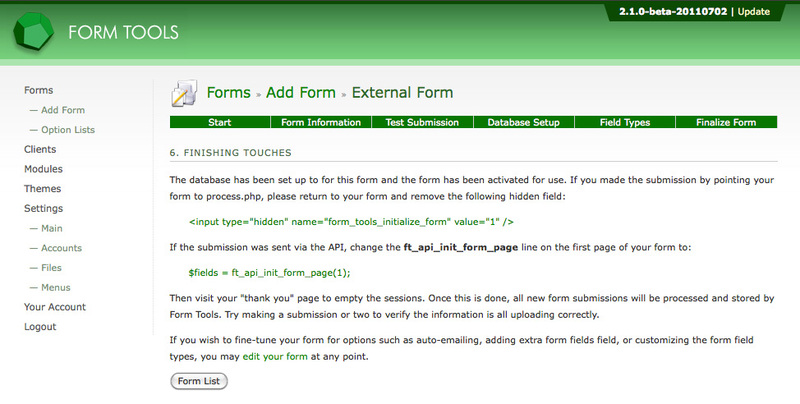 Once this is done, all new form submissions will be processed and stored by the program. And you're done! Congratulations, you've finished configuring your form!